WORCESTER – When it comes to helping businesses discover what ails them, author and consultant Ainslie Waldron advises clients to think like an outsider. 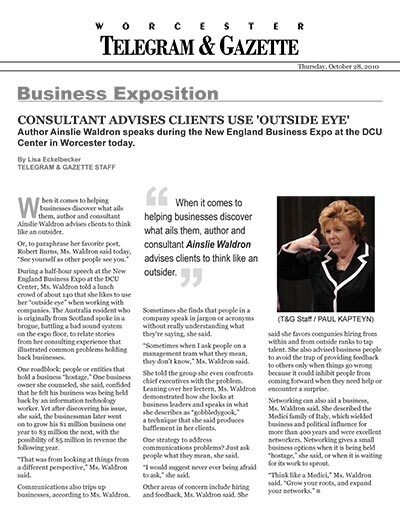 During a half-hour speech at the New England Business Expo at the DCU Center, Ms. Waldron told a lunch crowd of about 140 that she likes to use her “outside eye” when working with companies. The Australia resident who is originally from Scotland spoke in a brogue, battling a bad sound system on the expo floor, to relate stories from her consulting experience that illustrated common problems holding back businesses. One roadblock: people or entities that hold a business “hostage.” One business owner she counseled, she said, confided that he felt his business was being held back by an information technology worker. Yet after discovering his issue, she said, the businessman later went on to grow his $1 million business one year to $3 million the next, with the possibility of $5 million in revenue the following year. “That was from looking at things from a different perspective,” Ms. Waldron said. Communications also trips up businesses, according to Ms. Waldron. Sometimes she finds that people in a company speak in jargon or acronyms without really understanding what they're saying, she said. “Sometimes when I ask people on a management team what they mean, they don't know,” Ms. Waldron said. She told the group she even confronts chief executives with the problem. Leaning over her lectern, Ms. Waldron demonstrated how she looks at business leaders and speaks in what she describes as “gobbledygook,” a technique that she said produces bafflement in her clients. One strategy to address communications problems? Just ask people what they mean, she said. “I would suggest never ever being afraid to ask,” she said. Other areas of concern include hiring and feedback, Ms. Waldron said. She said she favors companies hiring from within and from outside ranks to tap talent. She also advised business people to avoid the trap of providing feedback to others only when things go wrong because it could inhibit people from coming forward when they need help or encounter a surprise. Networking can also aid a business, Ms. Waldron said. She described the Medici family of Italy, which wielded business and political influence for more than 400 years and were excellent networkers. Networking gives a small business options when it is being held “hostage,” she said, or when it is waiting for its work to sprout.